Any males got any sperm to give? Facebook wants to know! The wonderful world of Facebook. There are a lot of people who basically grew up with social media sites, and basically take "Facebook" for granted. When you break down Facebook as a site and a 'piece of tech', you would marvel at how well developed it really is. One thing Facebook has become is a very valuable information source in a web 2.0 world. Instead of advertising to large crowds with a billboard or putting an ad in the paper and hope many people see it, Facebook has made it possible for companies to advertise to individual users based on 'who they are'. The ads are all based on the information in your profile. The ads ARE all about you! If you're single, you may nice a lot of ads that look something like this. And its sorta awesome that they dont discriminate on 'preference' or sexual orientation. Lets say you do managed to find that special someone and decide you want to spend the rest of your life with them, you get engages. NO WORRIES, Facebook has got you covered. After you get engaged, you notice that all your dating ads are gone, and now have been replaced with wedding ads. But what happens after you do get married? I was actually really curious. I was assuming baby planning or house buying was going to be next on the list. But nothing. Basically its all about hobbies or some new game they want me to play. Its a little boring, and somewhat depressing. To think that, now that I'm married, they don't have anything else for me. That is until Facebook got a lil bold and asked me straight out. Do I wanna Be a Hero? I can almost play g-d and help CREATE Babies. I'd be SUPERMAN, because I'm a 'SUPER MAN'! I mean, it is true. I have been married for almost 2 years, and I don't children of my own. 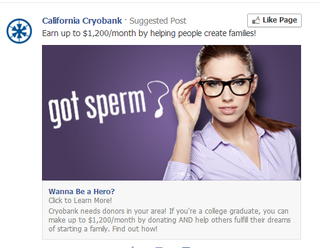 I guess I have some extra sperm to give? BUT GEESH Facebook. Buy a guy a drink first?